Our flagship line of big, bold aquatic creatures, brought to life in vivid color on durable repositionable vinyl decals. Known to grow in excess of 1,500 pounds, the blue marlin is by far one of the most sough-after game fish in the ocean. These powerful predators swim in both the Pacific and Atlantic oceans and are known for their acrobatic jumps, sheer power and beautiful colors. Choose Right or Left Facing art with a full size 46″ marlin or small size 23″ marlin. The Spotted Seatrout, also known as Speckled Trout, is a well known inshore game fish found along the east coast of the United States down into the southeast and also along the Gulf shores. We have posed this voracious Seatrout in full strike, along with some fleeing fingerling Mullet. A great addition to the decor of your inshore tackle shop, outdoors store, man cave or den, kids rooms, boat salon, or biology classrooms. 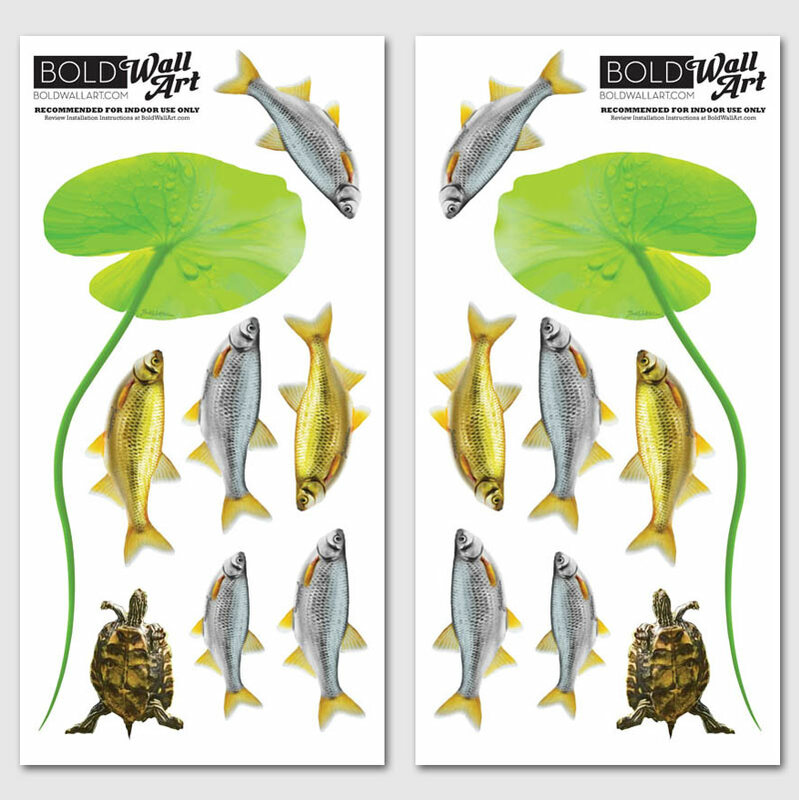 Seatrout wall decal measures 12″ x 10″ with Four (4) fingerling Mullet fish, each approximately 4″ long. The Atlantic Tarpon (Megalops atlanticus) or “Silver King” is a massive sport fish sometimes reaching over 300 pounds that prowls inshore and nearshore waters. Popular not as a tasty meal, but because of it’s accessibility and the huge fight that often features aerial leaps. We’ve captured the essence of this hungry Tarpon mid-strike, in iridescent colors, with its giant mouth ready to swallow up a snack of finger mullet. Choose Right or Left Facing art with a full size 41″ Tarpon. The California Yellowtail or Yellowtail Amberjack is found in the cold nutrient rich waters of California. We’ve captured this hard fighting sport fish in brilliant color along with a school of delicious squid. Every lake house or cabin needs a proper largemouth bass on the wall! Perhaps the most popular game fish on the planet, largemouth bass can be found in every U.S. state except Alaska. There is currently a tie for the world record largemouth bass, which stands at 22 pounds, 4 ounces. One was caught in Japan, and one in Georgia. In Spanish they’re called “dorado,” in Hawaiian it’s “mahi-mahi,” but most of us just call them dolphin. Whatever you call them, this game fish is always a welcomed treat at the end of a fishing line. They fight like a bull, flash vivid colors and taste great! No wonder we love them. The Northern Pike, or just Pike as some would call it, is a solitary predator and hard fighting gamefish popular in the US and Europe. Bold Wall Art has reproduced this powerful fish, armed with it’s deadly array of sharp teeth, in stunning detail. The Wahoo is a speedy and often solitary tropical ocean predator. One of the fastest fish in the sea, they can reach speeds of 60 mph. Fisherman around the world troll offshore and nearshore for these large, hard fighting and delicious fish. Captured here slashing through the water chasing a school of tasty flying fish, this repositionable Wahoo wall decal measures 21.5″ x 22.5″ with Five (5) Flying fish, each approximately 6″ wide. Relive that day on the flats with our red drum decal. In the Southeast, the red drum, or redfish, is king of the marsh. Lucky for you, our redfish tail all day and all night! Few fish look as colorful and dramatic on a wall than the sailfish. Your guests will definitely take notice of the sailfish’s tall dorsal fin as the fish chases flying fish along your wall. The stealthy Mako shark prowls far offshore dining on anything slower than it, which includes most everything since it’s the fastest shark on record. With top speeds of 46 mph and able to leap 30 feet into the air, the Mako is an impressive predator. Show your respect with our 4′ wall decal which will have all the little fishies keeping an eye on it’s arsenal of deadly teeth. Few fish fight as hard as the Yellowfin Tuna. Pound for pound, they may just be the baddest fish in the ocean. Celebrate your favorite catch with this cow tuna, which comes complete with four Skipjack tunas, one of the Yellowfin’s favorite snacks. The hawksbill sea turtle is one of the most beautiful marine reptiles on the planet. Gracefully ‘flying’ through the deep ocean waters he encounters all manner of colorful coral reef fish. 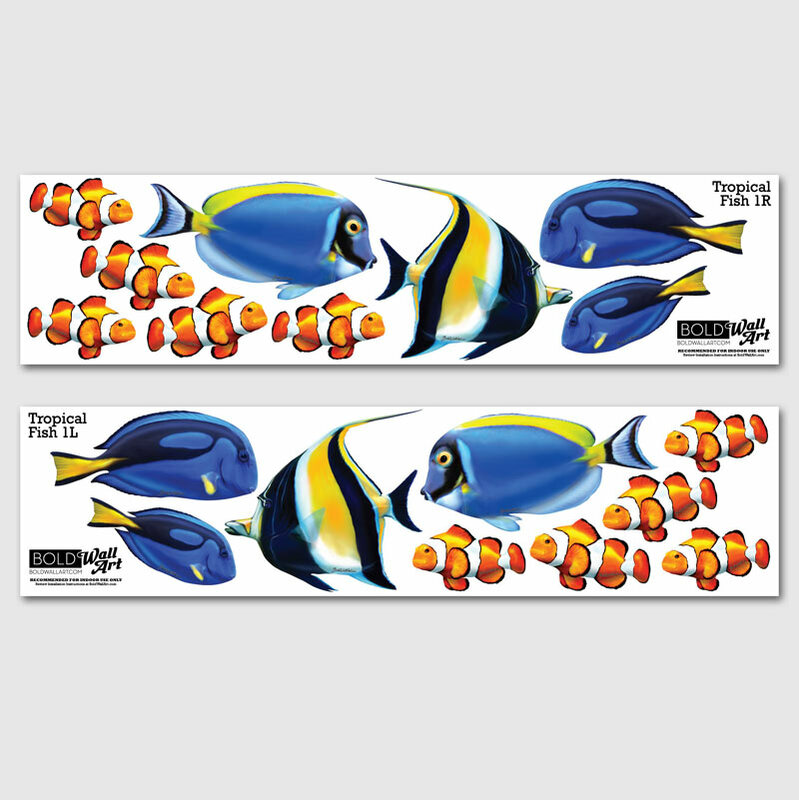 Assemble your own underwater scene with these high quality removable / repositionable wall art decal sets.